The former Marine was eating lunch Wednesday at Harry Browne’s in Annapolis during the vote and afterward, on a bench at the State House campus, recalled a similarly difficult debate about abortion funding that took place in the first of his three terms in the House of Delegates. He served in the Senate for 24 years. SB311 would have allowed terminally ill adults in Maryland to receive a prescription that would enable them to end their own lives. In one of the most significant votes the Senate has taken this session, the electronic tally board showed as many red votes as green: 23 to 23, with Sen. Obie Patterson, D-Prince George’s, listed as “not voting.” Here is a copy of the roll call. Bills in the Senate need 24 votes to proceed. Although the House version of the bill, HB399, sponsored by Del. Shane Pendergrass, D-Howard, passed by a vote of 74 to 66 on March 7, a bill has to pass both chambers before it can become law. 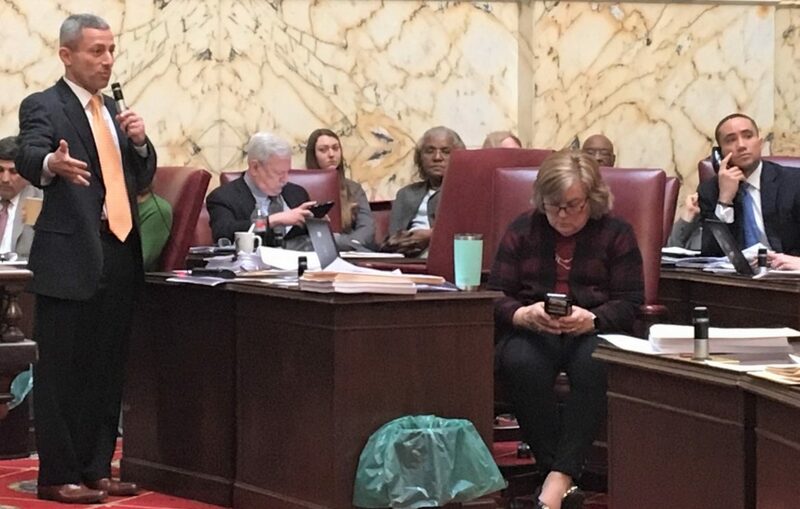 Sen. Bobby Zirkin, D-Baltimore County, who as committee chair presided over a voting session on amendments that dragged late into the night, said “it was very challenging, very emotional, very complicated,” to bring to the floor. Ten of the 47 senators got up to speak during bill debate Wednesday. Many shared personal stories of losing friends or loved ones, or stories about people who were considered terminally ill who recovered. At several points the chamber grew uncharacteristically quiet as senators absorbed the messages of their colleagues. Some senators who spoke noted moral or religious objections to the bill. Others stood up for personal autonomy in supporting the bill. Sen. Robert Cassilly, R-Harford, thought the bill itself was flawed. The bill’s sponsor and vice chairman of the Judicial Proceedings Committee, Sen. Will Smith, will deploy to Afghanistan this week with the Navy Reserve. After the vote, he thanked the committee for working on the bill. Sen. Michael Hough, R-Frederick and Carroll, who opposed the bill, shared his concern that the legislation would be broadened beyond the terminally ill in the future. “Where do you stop once you open this door?” Hough asked. Sen. Bryan Simonaire, R-Anne Arundel, said in opposing the bill that doctors can make mistakes in diagnoses. He said he watched his father overcome cancer and go on to live many more years. “There are no do-overs in this type of law,” he said. Sen. Delores Kelley, D-Baltimore County, who supported the bill, spoke of the difficulty of her daughter’s death. “We should respect the autonomy of that human being who says ‘I’ve had it, I need relief from what I’m going through,’” she said. “It’s an individual choice,” echoed Sen. Ron Young, D-Frederick, who said physician-assisted suicide is a more humane alternative than other suicide methods. In explaining his vote against the bill, Sen. Justin Ready, R-Carroll, said he was concerned about pressure that could be exerted on vulnerable people at the end of life. “There’s nothing in this bill that can have us be assured that the person is doing this free of any kind of coercion,” he said. He said by making death “cheap, fast and easy,” it can become “a duty to die,” a position echoed by Sen. Mary Beth Carozza, a Republican representing the Eastern Shore. “We have to be careful in these things. There are unintended consequences,” he said. Proponents argued that the bill actually made the process difficult, demanding two different doctors be involved, a mental health professional and verbal and written requests from the patient. 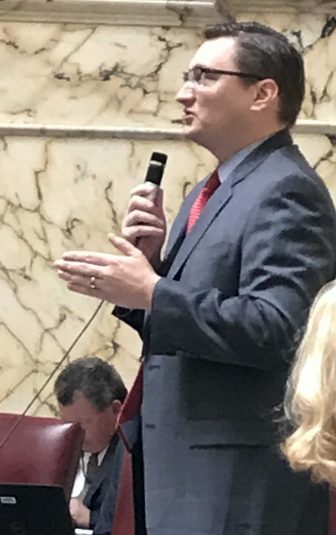 Sen. Ed Reilly, R-Anne Arundel, explained he was voting against the bill to be consistent with voting to repeal the death penalty several years ago. He said he recognized the significance of his vote on a highly-charged issue. “This could be our legacy. I’m in my 10th year. This could be the most important vote I have,” he said. Some version of death with dignity legislation has come before the legislature in 2015, 2016 and 2017. Maryland also considered physician-assisted death measures in 1995 and 1996, according to the web site www.deathwithdignity.org.